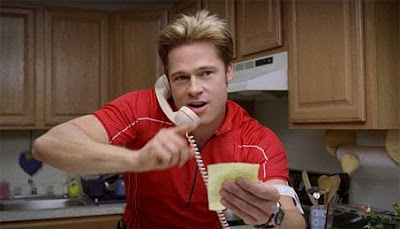 Burn After Reading (2008): The latest from the Coen brothers is a far cry from their Oscar-winning No Country for Old Men. While the former film is bleak and chilling, this latest film is much more on the silly side. A disc containing a washed-up C.I.A. operative's (John Malkovich) information ends up in the hands of two gym employees (Brad Pitt, Frances McDormand), one of which happens to be sleeping with a womanizing treasury guard (George Clooney), who is also sleeping with the C.I.A. operative's wife (Tilda Swinton). Confused yet? So are the C.I.A. guys watching it all happen (J.K. Simmons and David Rasche). The gym employees do their best to make a quick buck from the disc, leading to catastrophic results. Both Pitt and Simmons shine in their roles, and the Coens' subtle-yet-outlandish humor had me laughing out loud in the theater. Seriously, Pitt has never been this funny; his Zack Morris haircut and blank-stare naivety are hilarious. As far as redemptive/creative value, the film really doesn't contain much of the spiritual. None of the characters are worth emulating; the Coens have created a complete cast of losers. The C.I.A. guys even ask themselves, "what have we learned from this?" Answer: "I dunno. Don't do this again?" That's the biggest lesson from the film; don't be like these people. Does that mean it's not worth watching? Far from it. It's definitely an adult comedy and isn't for the under-17 crowd--though we sadly saw some parents walking out their 6-year-old from the theater--but it's a creatively funny film worth checking out. 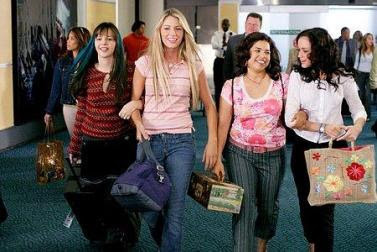 The Sisterhood of the Traveling Pants (2005): I watched this so that my wife and I could go see the sequel that just came out. I must admit, I was pleasantly surprised with the heart of this film. You can tell that it's based off of a young adult novel, but that doesn't mean it lacks depth. The young actresses in the main roles give good performances as teenage girls going through difficult adolescent turmoil. I was concerned that the whole "traveling pants" thing would become overly cheesy or "magical." But as one character narrates, the pants are more like a witness to the events of the girls' summer rather than the initiator. My biggest critique of the film is in its pacing--the film feels like an emotional roller coaster. It jumps from one girl's heartbreaking story to the next, leaving the audience's tear ducts drained (and with 45 minutes left in the film). But then again, could this be painting a fairly accurate picture of the emotional state of female adolescence (I've never been an adolescent girl, but I work with them all the time!). Overall, not bad. I'll let you know when Katie and I see the sequel! when molly and i watched burn after reading a woman was in there with 3 children under the age of 12. luckily she left just before george clooney unveiled his contraption. i enjoyed the movie, its no lebowski or fargo but brad pitt was funny.